METLOX POTTERY POPPY TRAIL SCULPTURED DAISY CUP/SAUCER! 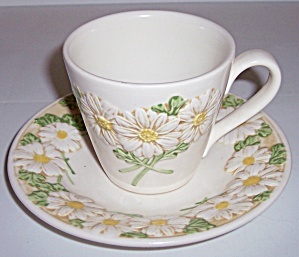 This is an offering for a pristine Metlox Poppytrail Pottery cup and saucer set in the lovely Sculptured Daisy pattern! Not a hint of use and has no nicks, chips, cracks or repairs. Shipping for this wonderful addition to your collection is $7.95.